The 15th of August, L’Assomption, is a public holiday in France. We knew that large crowds would head to the mountains as the weather forecast was favourable, and August is the peak season for mountain activities. To be able to find a parking spot in Le Boréon, we tried to leave early. When we arrived, the Salèse Valley parking was almost full. In addition, we saw that there was a fête patronale in Mollières, now a ghost village on the other side of Col de la Salèse. There was a lot of car traffic apparently heading there as the track that normally is closed had been opened for this event. So, the normally quite tranquil Salèse Valley was very busy that morning! 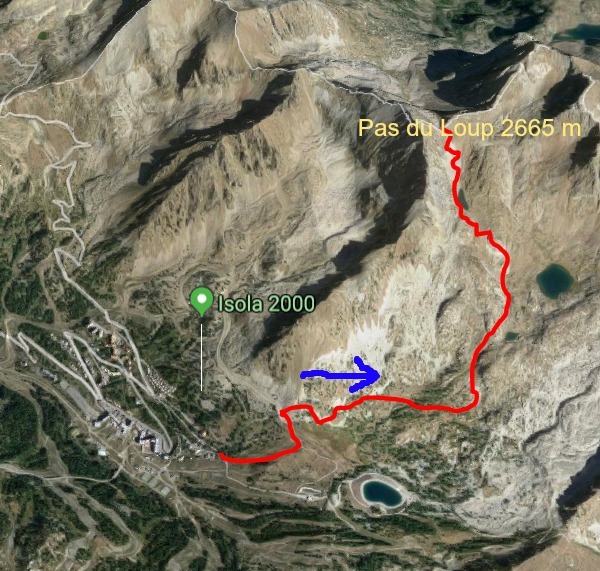 We had chosen to do a hike “off the beaten track”, first towards Lacs des Adus, then up to Mont Archas (2526 m) via Col de la Valette des Adus (2356 m) as we knew that most hikers would head to Lac Negre, Col de Cerise etc where chamois may be spotted. We started from signpost #434 at the parking, crossed the stream to signpost 397, and followed the trail that climbed steeply in the woods. We then passed a private refuge and Lacs des Adus. Most of the lakes were dry. We met only sporadic hikers and a few trail runners. We continued the ascent towards Col de la Valette des Adus, now above the tree line. The trail followed the border of the Mercantour National Park. From the col (signpost #394), we continued east along a well-marked trail towards Mont Archas already well visible in front of us. The yellow markings along the trail were new as the route is used by the trail runners. After a break at the saddle between Cime de la Valette and Mont Archas we were ready for the last 160 m climb to the summit. There were many trails, and we followed the one with yellow markings. The summit itself was marked with a large cairn. The 360° panorama view was quite stunning: Argentera, Cime du Gélas, you name it! The town of Saint-Martin-Vésubie was 1500 m below us. From the summit, we started the descent heading east, still using the trail runners’ itinerary. The initial descent was steep and rocky along a ridge, so our respect for trail runners increased even more! Eventually we came to a crossroads at signpost #393 and forked left to Les Adus, the area which we passed in the morning. At signpost #396, a little below the private refuge mentioned above, we closed the loop and headed back to our starting point in the Salèse Valley. Parts of the trail were rocky and hence more strenuous. The ascent from the valley was more or less continuous. However, navigation was easy as the signposts and marking were new. The following salad recipe makes a light and tasty lunch. It is full of vegetable protein, which we should be eating more of, antioxidants and heart-healthy olive oil. Cook the red quinoa in 250 ml water for 20 minutes. Let cool in a bowl. Rinse the white beans under running water and add to the bowl. Wash the cherry tomatoes, cut into halves and add to the bowl. Wash the spring onion, slice it including the green part and add to the bowl. Grind over some black pepper. Whisk the dressing in a small bowl, add to the vegetables and mix. Gently fold in the salad leaves. Divide the mixture in two bowls and decorate with basil leaves. 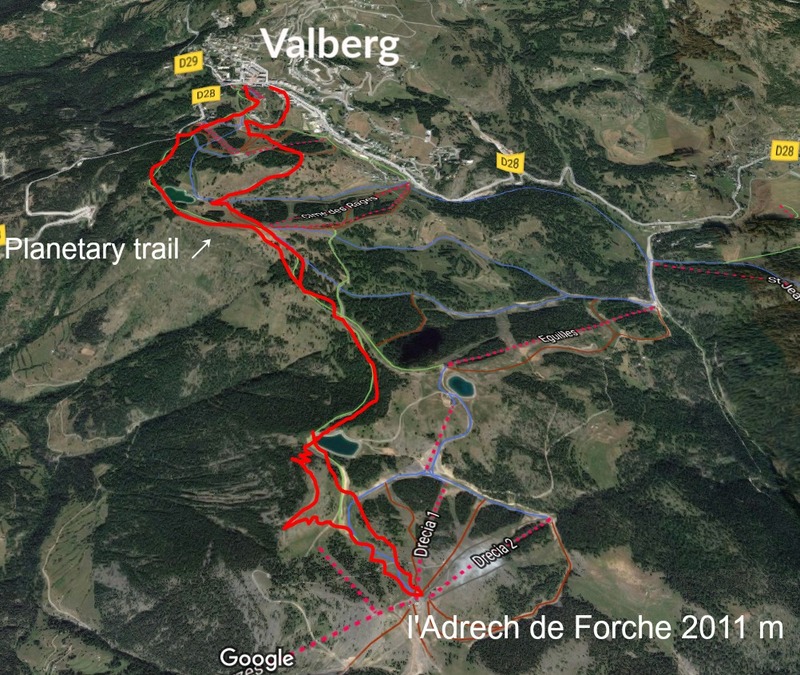 This relaxed walk starts from Valberg ski resort (1680 m) about 80 km from Nice. Valberg is built in a classic alpine style and has an atmosphere of a larger, chic resort. The trail is called Sentier Planétaire, the planetary path, because it is dedicated to astronomy; at various spots you will discover the sun, the earth and seven other planets as well as information about the milky way, galaxies etc. It is a great hike for kids too. In summer, some trails are dedicated to hikers, others to mountain bikers. From many spots you’ll be able to see the village and signposts are numerous along the trails. You will not get lost here! You can benefit from the crisscrossing paths and dirt roads and tailor-make your walks if you wish. 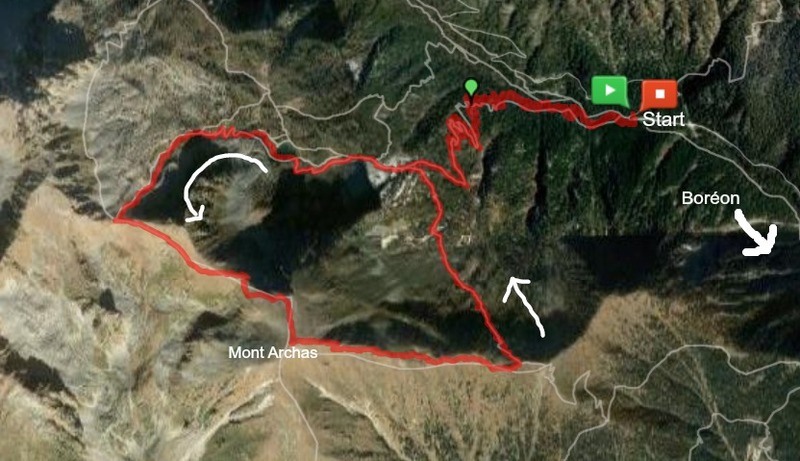 We modified the itinerary by taking the planetary trail on the way back, and by making an extension to a nearby summit called L’Adrech de Forche (2011 m). From the centre of Valberg we started ascending along a road first to Lac de Sénateur then further to a crossroads and signpost #20 where we came to the planetary trail proper. The itinerary continued in the woods to a small summit with the planet Uranus. A short descent then took us to Col des Anguillers (1854 m, signpost #24), next to Lac des Anguillers. From here, we climbed along the trail, zigzagging in the woods up to the turning point of the planetary trail and the planet Neptune (1926 m). The summit of L’Ardeche de Forche was visible in the southeast. We descended about 50 m from Neptune then climbed up to the summit which was our turning point. Dome de Barrot was visible in the south while the long ridge of Mont Mounier dominated the scene in the north east. On the way back to Valberg, we used the dirt road to signpost #20, then the very picturesque path running along the western slope of the mountain (signposts # 11,10,9) with further astronomic information (albeit only in French) in several places. Even if you wouldn’t be interested in the theme itself, this walk along good trails offers truly great views. In the following recipe hazelnut powder, noisettes en poudre, is used instead of the usual breadcrumbs. This gives a nice nutty taste for the dish. In France we can buy hazelnut powder in ordinary supermarkets, but it is easy to make with a kitchen machine. Any leftover hazel powder can be added in your morning muesli. In a bowl, whisk the egg. Spread the flour on one plate and hazelnut powder on another plate. Warm the olive oil over medium-high heat in a large frying pan. Dip the escalope first in egg, then in flour, then in hazelnut powder and fry on both sides until golden brown. Transfer the escalope on an oven dish and bake in the oven for 15- 20 minutes depending on thickness. Meanwhile microwave some new potatoes and wilt three to four handfuls of baby spinach. Make a sauce by whisking together the mayonnaise and Dijon mustard. Divide the sauce in small bowls and place on the plates. Divide the escalopes, new potatoes and wilted spinach on the plates and serve at once. We wanted to explore another trail heading to Pas du Loup (2665m), a mountain pass at the Italian border above Isola2000. 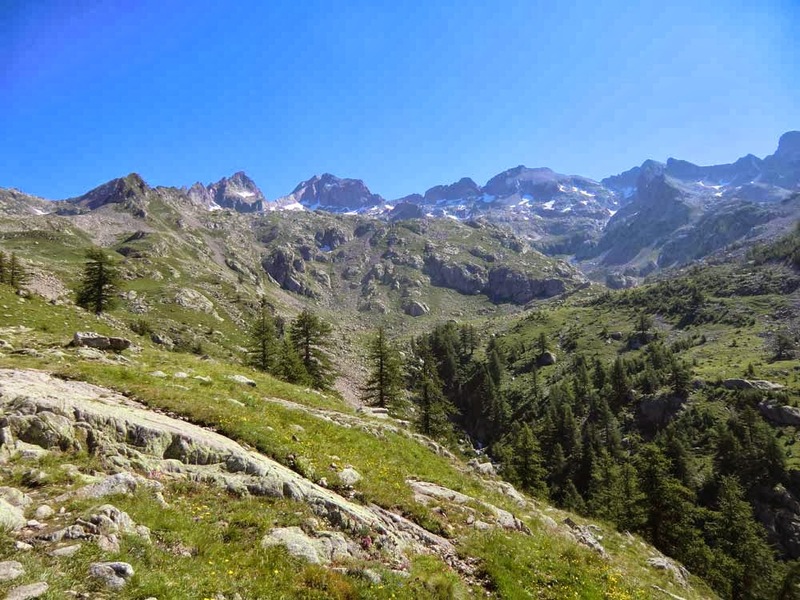 We have previously hiked from Isola2000 to Baisse de Druos, also at the Franco-Italian border. The trail to Pas du Loup forks left from the main artery at signpost #93 near the Lakes of Terre Rouge. The trail up to a small lake is easy. After the lake the path is much narrower and truly alpine. 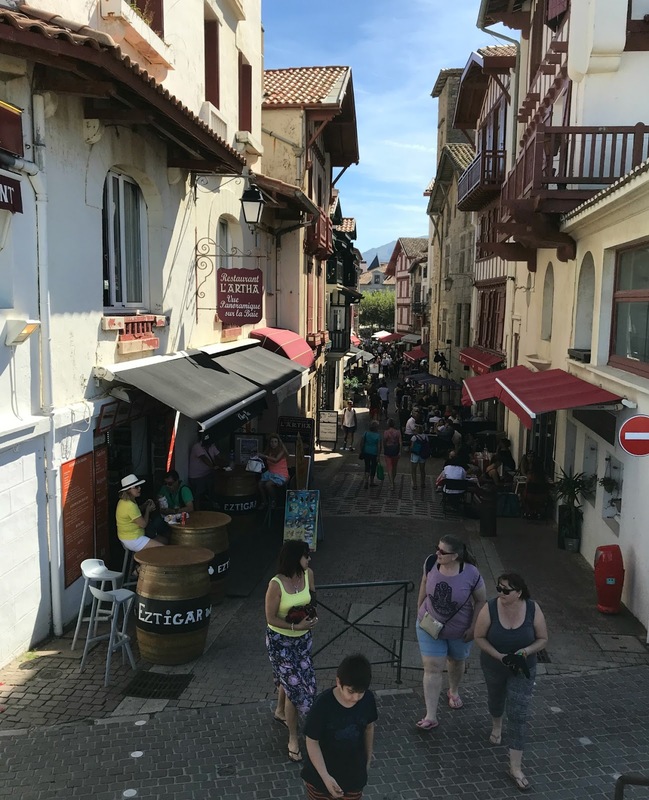 On a gorgeous August day, we parked at the end of a small street Front de Neige, with blue lamp posts (2080m). We started to ascend along a grassy ski run. The trail soon became much rockier, and we crossed a rock slide. We continued ascending along the popular trail to Baisse de Druos until we turned left at signpost #93 and soon reached a small lake with no name on the map. The trail seemed to be off the beaten path. Only sporadic hikers ascended here. Pas du Loup was well visible from the lake. We followed the zigzagging trail that mostly ran in a rocky terrain. The pass comprised a narrow ridge with steep mountains both sides. The northern incline of the pass on the Italian side was partly snow-covered. Certainly not your everyday border crossing! We descended back along the same trail. The ingredients for this carefree chicken leg recipe reflect typical South of France flavours; olive oil, garlic, Provençal herbs, Piment d’Espelette, black olives, bell peppers, oranges. Place the chicken legs in a large oven-proof dish. Wash and dry the oranges. Zest 1 orange into a small bowl. Then press the orange and add the juice to the bowl. Peel and mince the garlic cloves and add to the bowl. Add the black pepper, dried Provençal herbs, and Piment d’Espelette and mix. Pour the mixture over the chicken legs. Wash and dry the potatoes and bell peppers. Cut the potatoes into thick slices and the bell peppers into large pieces, then add to the oven-proof dish around the chicken legs. Slice the other orange thinly and scatter the slices on top of the chicken and vegetables. Drizzle the olive oil on top and bake for 1h. Decorate with black olives and parsley. 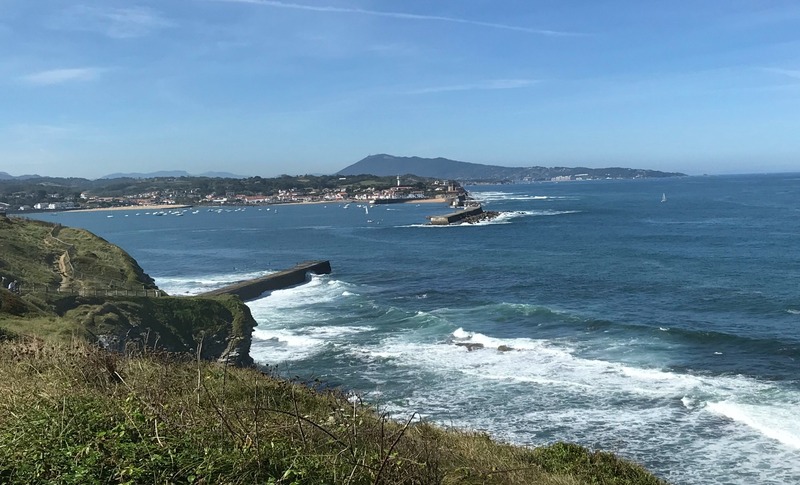 The 25 km long coastal trail starts in Henday next to the Spanish border and ends in Bidart near Biarritz. 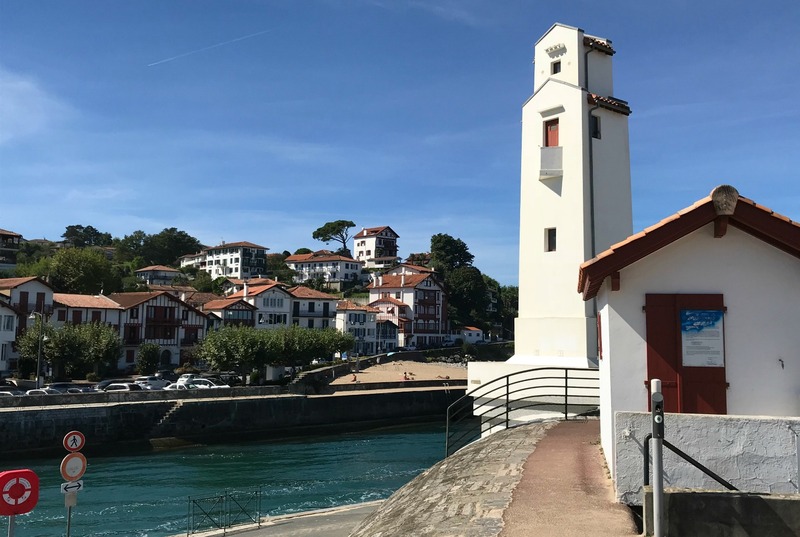 Here we describe only a part of the trail north of Saint-Jean-de-Luz. 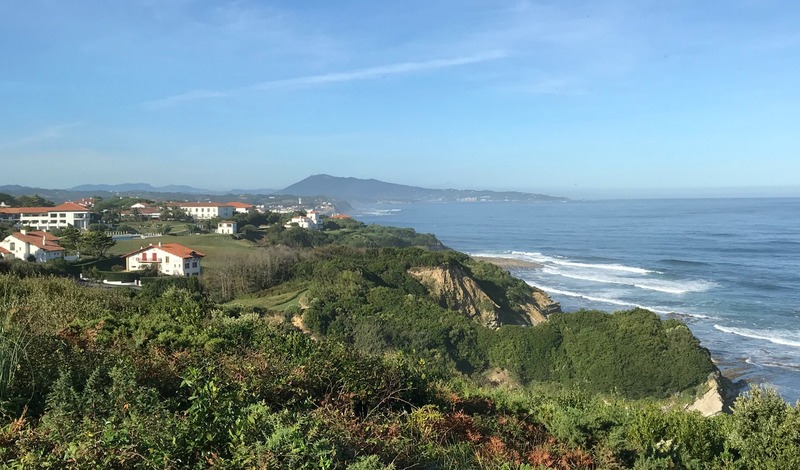 This is Basque Country in the Pyrénées Atlantiques department where the beautiful countryside meets the Atlantic Ocean. 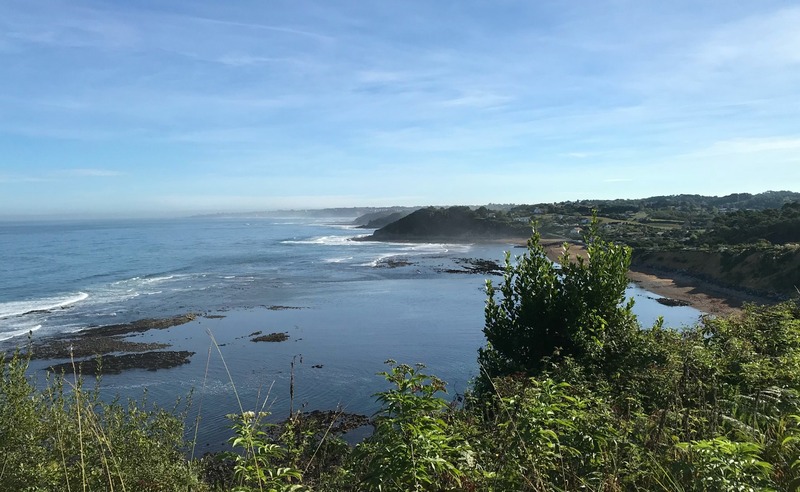 The views from the trail are magnificent: From the breaking swell waves to the undulating verdant landscape, and higher mountain tops further inland. The trail is paved in urban areas, but along the coast some unpaved stretches of the path dive into natural zones. The trail is marked with yellow signs. 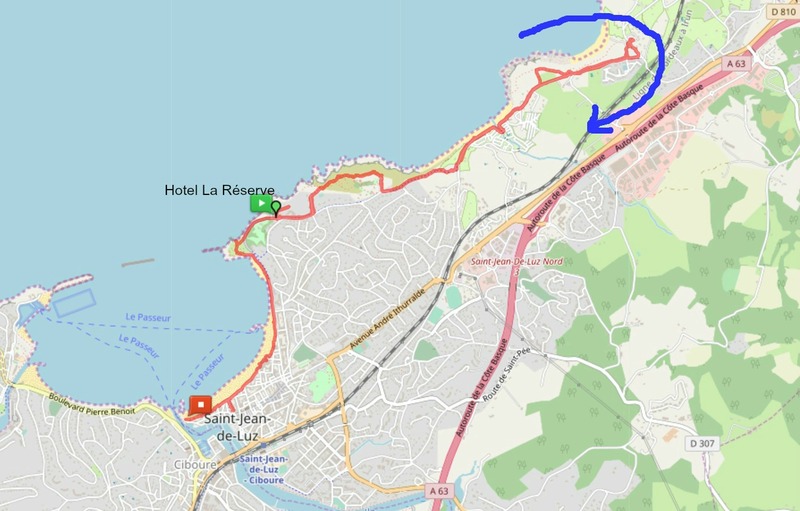 Compared with most coastal walks in Côte d’Azur, this trail is much easier. Our hotel was located only a few meters from the path. We first walked for an hour heading north. The late September weather was super. Surfing is a big thing here so we got to watch their efforts as well. 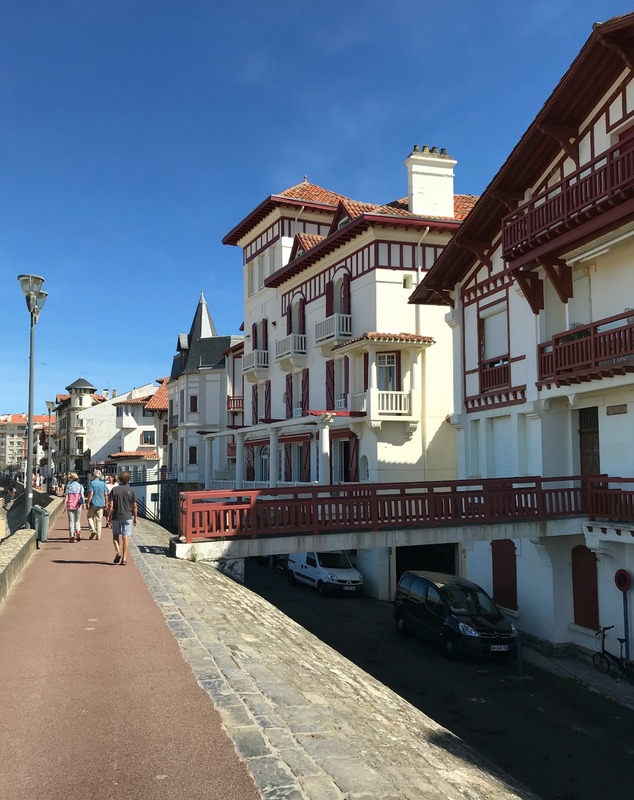 We turned back after an hour and headed back along the trail, and continued past our hotel towards St-Jean-de-Luz for lunch. Not surprisingly there were several small restaurants offering fresh local fish, seafood and Basque specialities. Virtually everyone had merlu de ligne, line-caught hake on the menu. After lunch, we walked to the entrance of the harbour, took off our shoes and walked back along the beach. The trail image (GPS track) shows our itinerary. The distance between end points is about 7 km. This colourful and anti-oxidant rich salad will bring back summer memories. Preheat the oven to 190° C.
Oil an oven-proof dish with 1 tbsp. olive oil. Peel and slice the red onions and scatter in the bottom of the oven-proof dish. Peel and dice the sweet potato and scatter in the dish. Sprinkle 1 tbsp. olive oil over the vegetables and roast for about 30- 40 minutes until the sweet potato is soft. Meanwhile make the dressing by whisking together all the ingredients. When the vegetables are soft, remove the dish from the oven and pour over the dressing. Toss well. Divide the vegetables on the plates. Gently incorporate the rocket leaves and almond slices. Crumble over the goat’s cheese and serve warm with some good whole wheat bread. 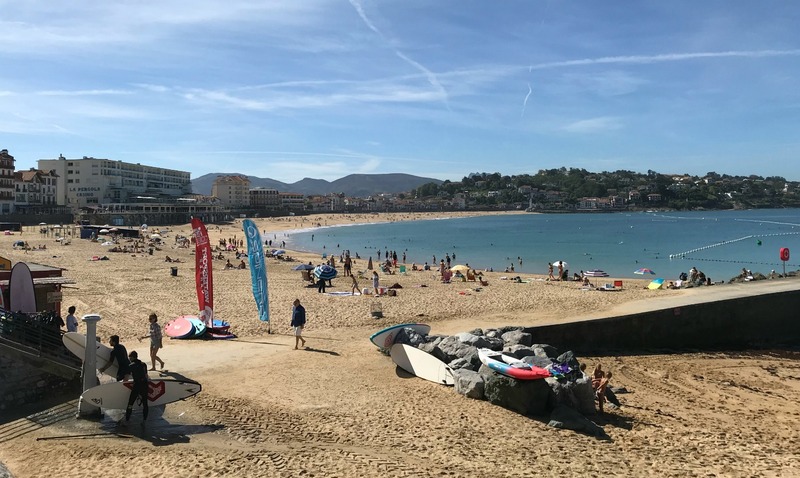 The coastal trail from Cap Camarat to l’Escalet and further to Gigaro Beach is far from the crowds, offers great views to the Mediterranean, and a feeling of being in the nature. The fragrance of the pines is mixed with sea air creating a magnificent sense of freshness. 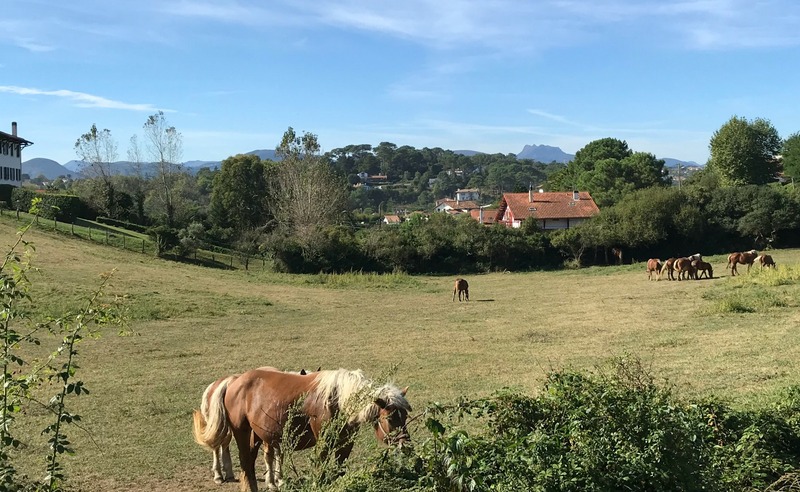 We have previously described a hike from Gigaro Beach to Cap Lardier. 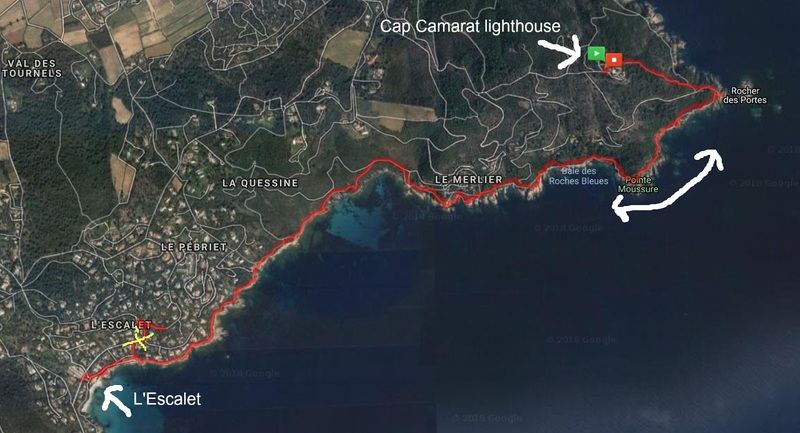 Today’s hike started from Cap Camarat lighthouse and ended in l’Escalet beach. We took the same trail back. Proper hiking shoes are recommended. This is not an easy flat seaside stroll which you can do in sandals. Especially the last part before l’Escalet is sauvage as the trail is narrow and sometimes ingrown. It is marked with old faded yellow signs. From the Cap Camarat lighthouse (elev. 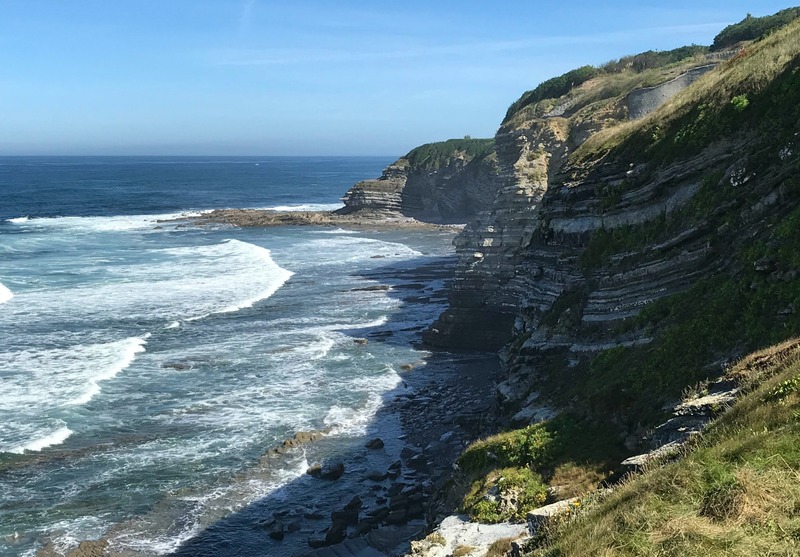 about 100 m) we started descending along the well-marked trail down to the tip of the peninsula and the small rocky island Rocher des Portes in front of it. We forked right along the coastal trail. Markings were frequent, and there were numbered waypoints along the path as well. Following the coast and avoiding several private properties en route, the distance felt actually longer than just looking at the map. There were numerous short ascents and descents as well, some of them rather steep. Even in mid-September the day was very warm and humid, and the small beaches along the trail were tempting. 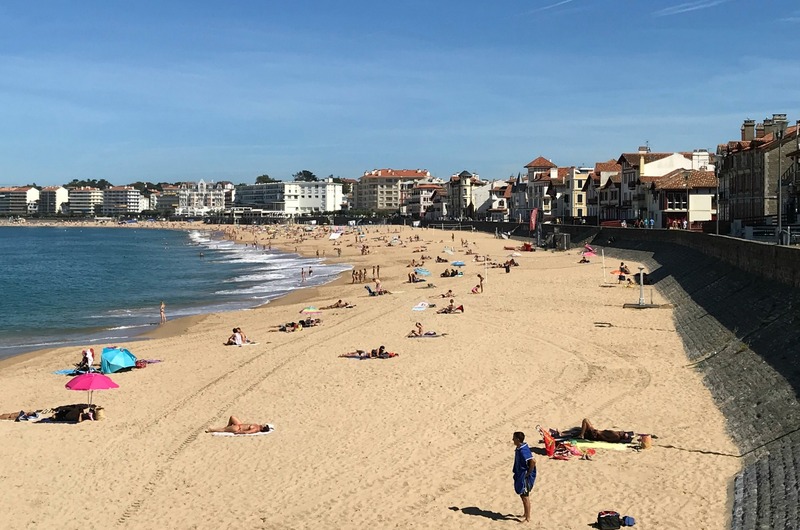 We reached l’Escalet in about 2h 20 where the beach life was still in full swing.